DEERPARK (WABC) -- An abused and severely emaciated dog that was found abandoned along the side of a highway in Deerpark last week died from its injuries over the weekend. Deerpark police confirm that Sally was too far gone and passed away Sunday. Authorities searching for the person or persons responsible say they are working on leads but had no information to report at this time. A driver traveling along US Route 209 near 3rd Street Cuddebackville observed something laying on the side of the road last Wednesday and pulled over to investigate. 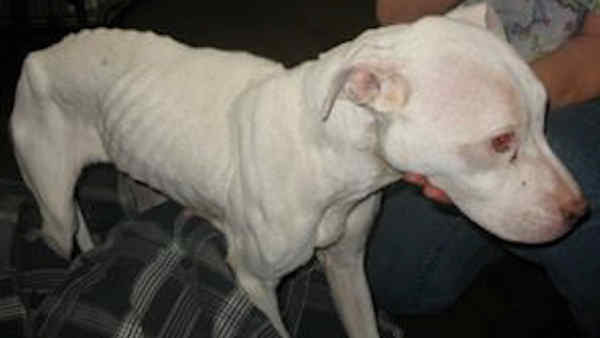 He found the pit bull/terrier mix emaciated and unable to move. The dog was transported to the Humane Society of Port Jervis/Deerpark, where she was named Sally and began to receive emergency care. "She arrived very cold," said Susan Beecher, Director of Humane Society of Port Jervis and Deerpark. "We don't know how long she was laying on the side of the road in the rain." She hadn't moved much or eaten anything, but her caretakers remained hopeful. Veterinarians believed she has been without food for at least two weeks and said she could not stand on her own. She was on IV antibiotics and vitamins, and officials said all efforts were in place to save her. But in the end, it wasn't enough. The members of the Town of Deerpark Police Department take matters involving animal cruelty and/or neglect exceptionally serious and are seeking public assistance in identifying the owner of this dog. This investigation is continuing and confidential information from members of the public is crucial in this case. Information can be provided to the police department via private Facebook message to this page or by contacting 845-856-4333.